Importing a vCenter infrastructure into vOneCloud can be carried out easily through the Sunstone Web UI. Follow the next steps to import an existing vCenter cluster as well as any already defined VM Template and Networks. You will need the IP or hostname of the vCenter server, as well as a user declared as Administrator in vCenter. VirtualMachine.State.CreateSnapshot Required to create a new snapshot of a virtual machine. System.Read Required to rename Uplink port group for a distributed switch only if you want OpenNebula to create distributed virtual switches. DVSwitch.Delete Required if you want OpenNebula to destroy a distributed virtual switches that was previously created by OpenNebula. DVPortgroup.Delete Required if you want OpenNebula to destroy a distributed port group that was previously created by OpenNebula. For security reasons, you may define different users to access different ESX Clusters. 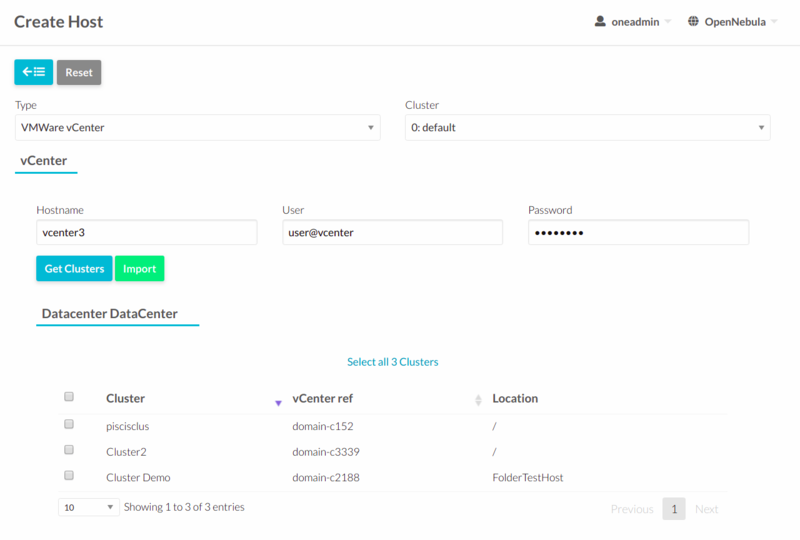 A different user can be defined in OpenNebula per ESX cluster, which is encapsulated in OpenNebula as an OpenNebula host. Log in into Sunstone as CloudAdmin, as explained in the previous section. The CloudAdmin user comes pre configured and is the Cloud Administrator, in full control of all the physical and virtual resources and using the vCenter view. Views will be explained later in its own section. 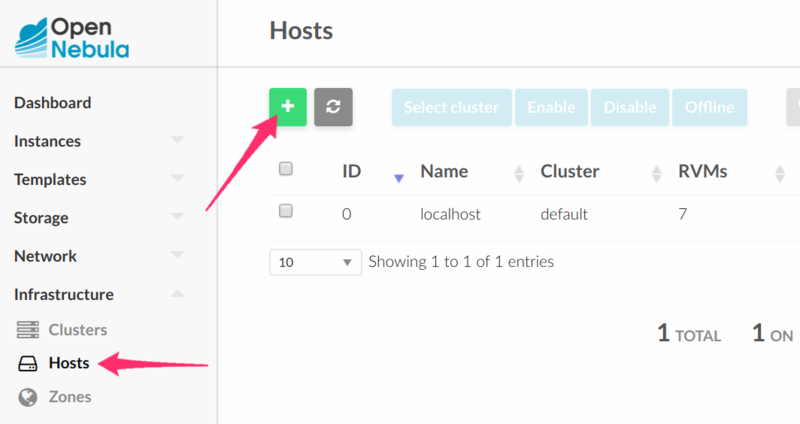 To import new vCenter clusters to be managed in vOneCloud, proceed in Sunstone to the Infrastructure --> Hosts tab and click on the “+” green icon. vOneCloud does not support spaces in vCenter cluster names. Now it’s time to check that the vCenter import has been successful. In Infrastructure --> Hosts check if vCenter cluster has been imported, and if all the ESX hosts are available in the ESX tab. Take into account that one vCenter cluster (with all its ESX hosts) will be represented as one vOneCloud host. Is not possible to import individual ESX hosts, they need to be grouped in vCenter clusters. If the vCenter infrastructure has running or powered off Virtual Machines, vOneCloud can import and subsequently manage them. To import vCenter VMs, proceed to the Wilds tab in the Host info tab representing the vCenter cluster where the VMs are running in, select the VMs to be imported and click on the import button. After the VMs are in the Running state, you can operate on their life-cycle, assign them to particular users, attach or detach network interfaces, create snapshots, do capacity resizing (change CPU and MEMORY after powering the VMs off), etc. Once a Wild VM is imported, vOneCloud will reconfigure the vCenter VM so VNC connections can be established once the VM is monitored. Datastores and VMDK images can be imported / reacquired from the Storage --> Datastores and Storage --> Images respectively. Since datastores are going to be used to hold the images from VM Templates, all datastore must be imported before VM Template import. Images Datastore. Stores the images repository. VMDK files are represented as OpenNebula images stored in this datastore. System Datastore. Holds disk for running virtual machines, copied or cloned from the Images Datastore. For example, if we have a vcenter datastore called ‘’nfs’‘, when we import the vCenter datastore into OpenNebula, two OpenNebula datastores will be created as an Images datastore and as a System datastore pointing to the same vCenter datastore. If the vCenter instance features a read only datastore, please be aware that you should disable the SYSTEM representation of the datastore after importing it to avoid OpenNebula trying to deploy VMs in it. When an image or a datastore is imported, vOneCloud will generate a name automatically that prevents conflicts if you try to import several files with the same name but that are located in different folders inside the datastore, or try to import datastores with the same name in different vCenter instances. The image name contains the file’s name, the datastore’s name and a 12 character hash, whereas the datastore contains the datastore name, the vcenter instance name, the datacenter where it lives and the datastore type between parentheses. These names can be changed once the image or datastore has been imported. OS: A bootable disk Image. Every VM template must define one DISK referring to an Image of this type. These images can be imported or uploaded. CDROM: These Images are read-only data. These images can also be imported or uploaded. DATABLOCK: A datablock Image is a storage for data. These Images can be created from previous existing data (e.g uploading a VMDK file), or as an empty drive. Non-persistent images. These images are used by at least one VM. It can still be used by other VMs. When a new VM using a non-persistent image is deployed a copy of the VMDK file is created. Persistent images. A persistent image can be use only by a VM. It cannot be used by new VMs. The original file is used, no copies are created. Disks attached to a VM will be backed by a non-persistent or persistent image although volatile disks are also supported. Volatile disks are created on-the-fly on the target hosts and they are disposed when the VM is shutdown. Since datastores are going to be used to hold the images from VM Templates, all datastore must be imported before VM Template import. In vOneCloud, Virtual Machines are deployed from VMware VM Templates that must exist previously in vCenter and must be imported into vOneCloud. There is a one-to-one relationship between each VMware VM Template and the equivalent vOneCloud VM Template. Users will then instantiate the OpenNebula VM Template and OpenNebula will create a Virtual Machine clone from the vCenter template. vCenter VM Templates can be imported and reacquired using the Import button in Virtual Resources --> Templates. Fill in the credentials and the IP or hostname of vCenter and click on the “Get Templates” button. When a VMware VM Template is imported, vOneCloud will detect any virtual disk and network interface within the template. For each virtual disk, vOneCloud will create an vOneCloud image representing each disk discovered in the template. In the same way, vOneCloud will create a network representation for each standard or distributed port group associated to virtual network interfaces found in the template. The imported vOneCloud VM templates can be modified selecting the VM Template in Virtual Resources --> Templates and clicking on the Update button, so the resulting VMs are adjusted to user needs. Check the advanced features guide for additional features available for VM Templates. VMs instantiated through vOneCloud will be named in vCenter as ‘one-<vid>-<VM Name>’, where <vid> is the id of the VM and VM Name is the name given to the VM in vOneCloud. This value can be changed using a special attribute set in the vCenter cluster representation in vOneCloud, ie, the vOneCloud host. This attribute is called “VM_PREFIX”, and will evaluate one variable, $i, to the id of the VM. A value of “one-$i-” in that parameter would have the same behaviour as the default. This attribute can be set in the “Attributes” section of the vOneCloud host, in the info panel that shows after clicking on the desire host. The name assigned to the template in OpenNebula contains the template’s name, vCenter cluster’s name and a 12 character hash. That name is used to prevent conflicts when several templates with the same name are found in a vCenter instance. Once the vCenter template has been imported, that OpenNebula’s name can be changed to a more human-friendly name. Similarly, Networks and Distributed vSwitches can also be imported / reacquired from using a similar Import button in Infrastructure --> Virtual Networks. Ethernet: Does not manage IP addresses but rather MAC addresses. If a starting MAC is not provided, vOneCloud will generate one. The networking information will also be passed onto the VM in the Contextualization process. It is possible to limit the bandwidth of any VM NIC associated to a particular virtual network by using the Inbound/Outbound Traffic QoS values as seen in the next image. vOneCloud does not support spaces in VMDKs paths nor names. Resources imported from vCenter will have their names appended with a the name of the cluster where this resources belong in vCenter, to ease their identification within vOneCloud. vCenter VM Templates, Networks, Distributed vSwitches, Datastores, VMDKs and Virtual Machines can be imported regardless of their position inside VM Folders, since vOneCloud will search recursively for them. Everything is ready! Now vOneCloud is prepared to manage Virtual Machines. In Sunstone, go to Virtual Resources --> Templates, select one of the templates imported in Step 3 and click on Instantiate. Now you will be able to control the life cycle of the VM. More information on available operations over VMs here.